The double lock standing seam system provides a lightweight, sustainable and very durable roofing solution and is commonly used on many different building types including educational, healthcare, sports, commercial, religious and, of course, housing. The system is suitable for roofs pitched between 3º and 90º, barrel vaulted roofs, conical and domed roofs, and in general almost any type of roof that can be clad in elZinc®. This is a proven traditional system that has been used to install zinc since the origins of zinc roofing itself and continues to be by far the most popular method today. The fine lines of the standing seams give the system its light, attractive appearance and contribute to its flexibility. 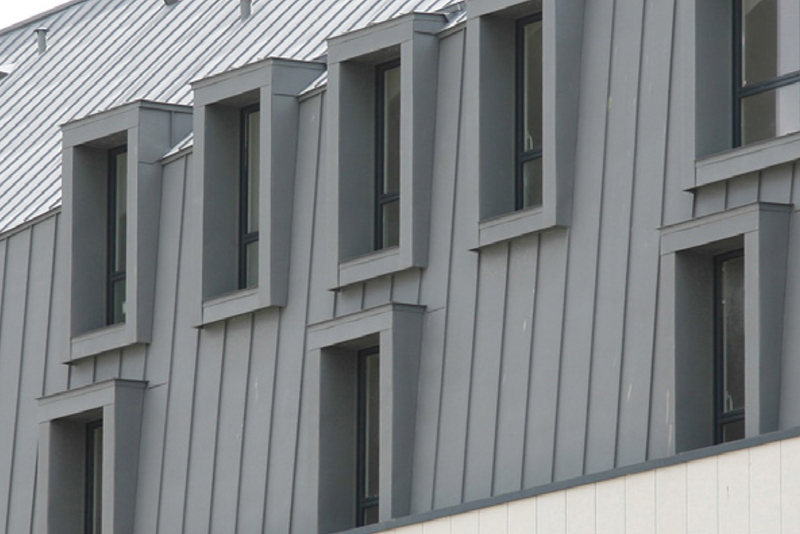 Modern profiling and seaming technology makes quick work of large roofs, decreasing installation times and the associated direct and indirect costs. It can be installed over a ventilated or non-ventilated roof construction, allowing the best solution to be chosen according to the characteristics of each project. The fixing is hidden and indirect. It needs a continuous support behind it and normally uses elZinc® sheet thicknesses of between 0.65 and 0.8mm. The covering withstands a certain amount of foot traffic.